Great Barrington Area TasteFest Winners! On Wednesday, October 24, more than 400 guests sampled spirits and tastes from some of the finest purveyors in the Barrington Area at the Barrington Area Chamber of Commerce (BACC) TasteFest. Winners of the Great Taste Awards were announced at the annual event held at the Onion Pub & Brewery located at 22221 N. Pepper Rd. in Lake Barrington. The event, now in its 15th year, has become one of the most popular gourmet tasting events of the year. During the event guests were asked to vote on the Great Taste Awards, which were announced at the end of the evening. 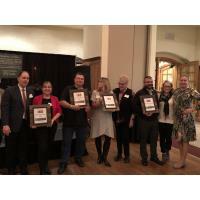 Winners included: Ruth’s Chris Steak House in South Barrington for Best Taste; Francesca’s Famiglia for Best Entrée; Garfield’s Beverage Warehouse for Best Spirit; and Anna Shea Chocolates & Lounge in The Arboretum of South Barrington for Best Dessert. Nearly 30 local restaurant and spirit vendors participated, including: Anna Shea Chocolates & Lounge, Apple Villa Famous Pancake House & Restaurant, Broken Earth Winery, Brunch Café, Cary Ale House & Brewing Company, Ciao Baby!, Clarke’s Bakery & Deli, Cooper’s Hawk Winery & Restaurant, Flesk Brewing Co., Francesca’s Famiglia, Garfield’s Beverage Warehouse, Georgios Chicago Pizzeria and Pub, La Pizza Via, McGonigal’s Pub, Nothing Bundt Cakes, On Occasion Catering & Events, Onion Pub & Brewery, Pepper Park Coffee, Pinstripes, Remember Charlotte’s Pizza, Ruth’s Chris Steak House, Southern Belles Barrington, The Solana of Deer Park, Tiburon Rum, Vin Chicago, and Wild Asparagus Catering. Live entertainment was provided by jazz musician Amy Yassinger and the Yazz Jazz Ensemble, and a popular highlight included the money machine, where guests stepped in to grab some fast (moving!) cash, hosted by presenting sponsor Barrington Bank & Trust Co., N.A. Event sponsor was SW Lake Lifestyle Magazine. Other premier sponsors included: GK Development, Inc., Marquardt of Barrington Buick/GMC, The Solana Deer Park, Brunch Café, KC Printing Services, Advance Design Studio, Ltd., Lucas Law, Pepper Park Coffee and the Daily Herald Media Group. Several business vendors also displayed their products and services while networking with the community. Those in attendance were: Advance Design Studio, Ltd.; Barrington Bank & Trust Co., N.A. ; ChiroOne Wellness Center of Schaumburg East; Daily Herald Media Group; Lucas Law, Attorneys & Counselors; Marquardt of Barrington Buick/GMC; Midtown Athletic Club; and WindowWorks. PHOTO CAPTION: Winners of the 2018 Great Barrington Area TasteFest awards, held on Oct. 24 at Onion Pub & Brewery in Lake Barrington, included (l-r): Jim Zbylut and Sarah Anderson of Ruth’s Chris Steak House for Best Taste; Andre Peters of Garfield’s Beverage Warehouse for Best Spirit; Julie Raio and Debra Jenrette of Anna Shea Chocolates & Lounge for Best Dessert; and Richard Lowell, Jenn Lowell and Andrea Alvarez of Francesca’s Famiglia for Best Entrée.